Republicans take part in the Saoradh National Easter Commemoration march from the Bogside in Derry to the City Cemetery on April 17, 2017. Several bands also took part including the John Brady Flute Band, Parkhead Republican Flute Band, Volunteer Julie Dougan Republican Flute Band and Martyrs of Ireland RFB. Photo by Kelvin Boyes / Press Eye. A dissident republican parade which saw people dressed in paramilitary garb in Londonderry yesterday has been described as an “unwelcome throwback” to Northern Ireland’s troubled past. People wearing military-style outfits and sunglasses with scarves partially covering their faces marched from the Bogside to the City Cemetery to mark the 101st anniversary of the Easter Rising. 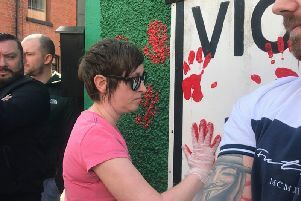 According to the Parades Commission, around 2,000 spectators were expected to turn out for the event, which was organised by dissident republican party Saoradh. DUP MP Gregory Campbell hit out at those involved and urged the PSNI and Parades Commission to investigate the matter. The East Londonderry MP said: “There have been a number of parades this weekend where people have marched in paramilitary clothing with their faces partially or totally covered to conceal their identities. “If people want to go out and commemorate a failed rebellion, then they are quite entitled to do that. “But these scenes with people dressed in paramilitary uniforms with their faces partially hidden are reminiscent of what Northern Ireland was like 20-30 years ago. “Both the PSNI and the Parades Commission need to look closely at this, as it is quite blatantly in breach of the commission’s code of conduct. Parade organisers are responsible for ensuring that all those taking part comply with the Parades Commission Code of Conduct, which covers aspects including music, flags and regalia. Failure to do so can lead to prosecution and can also be taken into account by the commission in subsequent decisions. Yesterday’s incident comes after police promised a “robust” investigation into an illegal dissident republican parade in Lurgan. A small number of people wearing military garb and sunglasses with scarves partially covering their faces walked through the Kilwilkie estate in Lurgan on Saturday. According to police, there were 50 notified parades taking place across Northern Ireland yesterday. All passed off peacefully with the exception of a minor incident in Bishops Field, Londonderry. Assistant Chief Constable Barbara Gray said: “A proportionate and appropriate policing operation was implemented for all parades.